Posted by Shelley Grell on October 1st, 2012. 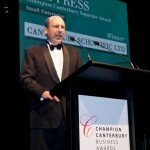 Press release, 1 October 2012, Canterbury Scientific, Christchurch, New Zealand: Canterbury Scientific has won the Global Operator Award and the Supreme Award in the small enterprise class at the 2012 Champion Canterbury Awards. An audience of over 1100 regional business leaders attended the awards ceremony at Christchurch’s CBS Arena on Thursday 27 September. Champion Canterbury is the pre-eminent business awards programme in the region, celebrating enterprise, resiliency and success in the region. The Global Operator category recognises innovative importers and exporters who contribute to Canterbury’s international reputation and the Supreme Award winner is selected from among the eight category winners.